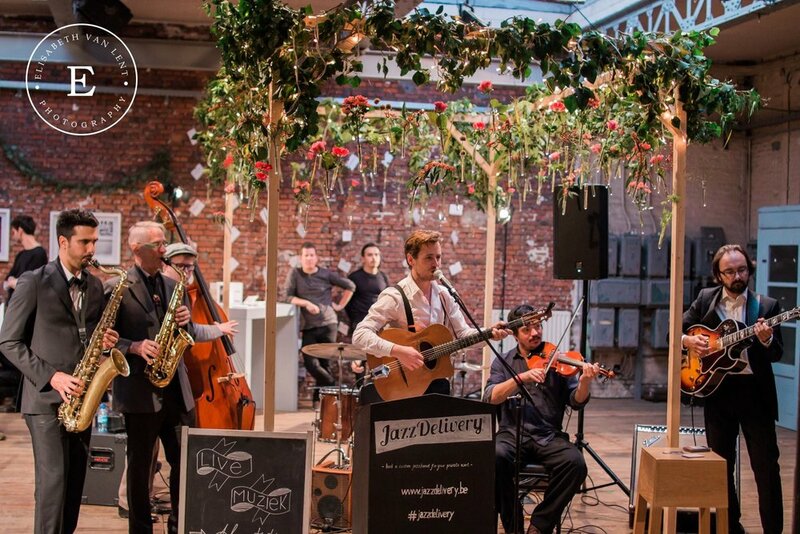 JazzDelivery is an easy-going, hip collective of jazz musicians that play live music. Create the Jazz Band you want to hear. Choose as many musicians as you like and create your your own preferred JazzPack with its own unique sound. You know what you’d like to hear and you have a good idea of your budget. Now you can pick your instruments, choose your sound to match your preferences. We will create a JazzPack© (a group of musicians) that works in tune with your needs. Jan Van den Bleeken, founder of other Swing bands such as Radio Muzak has a lot of experience as a bandleader and guarantees that he’ll compile a great jazzband for your needs! Today, with all the computers and digital music out there, the power of live music is underestimated. But listening to live music you can feel it in your bones that it is just as important (or even more important) to have the right set-up of music, than it is to have the right decoration or food. Music has its own colour, its own architecture. This is a real experience. People are going to remember the music, the atmosphere, what they felt, at any event, wedding or reception, much more than the dinner they had. We are all professionally trained musicians so the quality of our sound is guaranteed. We play traditional jazz music, which is instantly recognized by any crowd. It is a collective inheritance. 3% of gross revenue goes to the independent non-profit organisation Music Fund that brings together culture and humanitarian action. Our music is played the way it is supposed to be played. As it was done 80 years ago. In the twenties, jazz musicians had a lot of fun playing, so don’t be surprised to see us getting into the vibe and having some good, crazy fun. It is very important to us that we actually play ‘Acoustic Music’. Nowadays most music played at events is too strongly amplified and therefore too loud. We play only acoustic instruments such as an acoustic Selmer jazz guitar, vocals, double bass, trumpet, trombone, clarinet, accordion, saxophone, violin and drums. We play in various tempos, medium and fast played tunes often get the crowd moving. Even with the most simple receptions, there is almost always some interaction between the musicians and the crowd. People find they can’t help themselves and just start jiving even when they weren’t planning to do so. Jazz is one of the youngest broad musical genres. A genre born in the United States is now being played the whole world over. Jazz asks for a certain interaction; interaction between musicians as they are free to improvise within the form, and interaction between the crowd and the musicians.